Mainades were the female companion of god Dionysus. 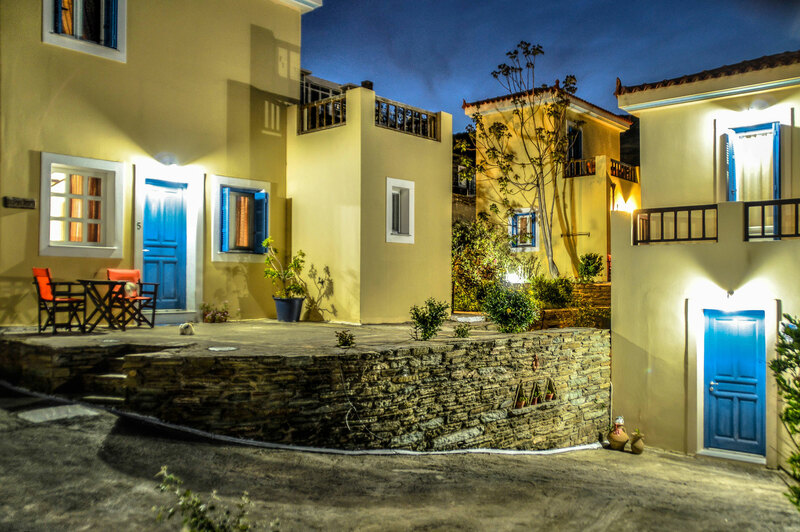 We’ve stolen five of them, we transformed them into modern warm, two-storey guesthouses for 2-4 persons and we’ve placed them on our area, Mainites, so that they can watch the whole Chora of Andros, the villages and the sea. Furthermore we’ve build “Little Mainades”, four studios, that give another choice to the visitor, who will choose this house complex for his staying. 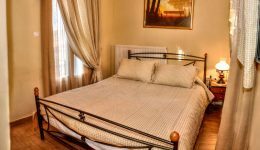 Each maisonette has its own “madness”, its own colour and style, but each and everyone modern in thought (comforts) and traditional in appearance, awaits to offer you hospitality, to show you around, to make you forget or remember, to have fun or to rest. 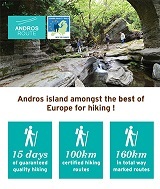 Welcome to Andros, to Mainites, to Mainades… Welcome to the other Cyclades, those of water and green. We thank you for letting us give life to your vacations, so that they’ll become unforgettable, the way you dream and we can contribute to this achievement. EVRYPYLI In the continuous parties of Dionysus participates Evrypyli amongst other Mainades and Satyrs. 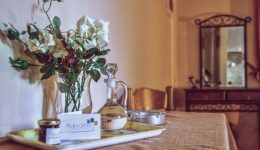 The residence with this name offers to the guest the opportunity to admire from above the marvellous view of east Andros as he rests on one of the two verandas of its first floor. TERPSICHORE Studio Terpsichore was one of the well-known “priestesses” of god Dionysus. The residence with the same name stands at the southern end of Mainades complex. 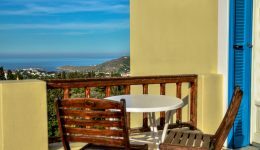 From its attic’s terrace the guest faces the magnificent view that offers the green landscape of the central part of Andros. Beautiful, well-preserved rooms, very clean, have everything you may need for a few days (the kitchen has almost everything a normal household does, there was even an ironing board, a cloth spreader, a bubble bath) .The owners have taken care of everything (water in the fridge, basic materials to prepeare a breakfast) and welcome you with their own local sweet. The breakfast basket very delicious (hot rolls, home-made jam and perfect spits with spirulina), I highly recommend it. Generally they were available at any time, even a problem with the water in the wider area which affected the rooms was arranged in the best possible way.